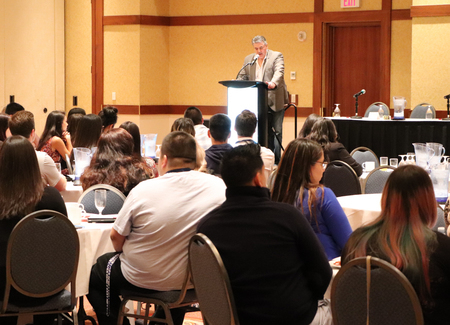 Ray Wanuch, Cando Executive Director, welcomes 59 youth delegates to the Cando Economic Development Youth Summit. Cando’s first ever Economic Development Youth Summit was such a success organizers hope to make it an annual event. “These are going to be the next economic development officers and leadership in their communities,” said Cando Executive Director Ray Wanuch of the participants. Almost 60 of the brightest young minds took part in the four-day event held at the River Cree Resort on the Enoch Cree Nation just west of Edmonton. Ray Wanuch, Cando Executive Director. Wanuch was impressed with the delegates, although the goal of attracting First Nations, Métis, Inuit and non Indigenous delegates aged 18-30 years from each of the 10 provinces and three territories did not happen. Delegates were selected through an application process, which included an essay on economic development and land management. “The future is very bright. We all contribute to the gross domestic product in this country and we know there should be more Indigenous GDP. I think with the skills these youth now have, they’re going to be able to be very productive when it comes to generate an economic base not only in their communities but in Canada,” said Wanuch. The event included three panels: lands planning, economic development and entrepreneurship. Delegates were given case studies and information and had to apply what they learned. It’s important that today’s youth understand what it takes for their communities to be economically viable, Wanuch says. “The economic horse leads the social cart,” he said. Governments rarely have enough money to address these social concerns, he points out, so indigenous communities need to be able to bankroll the solutions through strong economic development. Wanuch is confident that participants came away with both knowledge and energy. Feedback through a quick survey was positive. “We’re on the right track,” he said, pointing out delegates rated the event as five stars out of five. She adds, though, that Cando officials also took something away from the event: renewed energy. Shawna Morning Bull, Cando Alberta Director. The summit was 20 years in the making, says event coordinator Carmelle Nepoose, noting that Cando had wanted to focus on youth in some manner. The summit was put on at a price tag of $160,000 as delegates had all their costs covered. At the last minute, RBC stepped up with $85,000. That kind of support will be needed going forward, she says. “We want to stay in contact with our delegates and see how productive they are. Once we get some of those indicators back we can share that with our sponsors and prove they are getting a huge return on their investments,” said Wanuch. Morning Bull says she would also like to see community sponsorship as a way for communities to invest in their youth. Shawna Morning Bull, Cando Alberta Director presents to the yoyth delegates on the important work of an Economic Development Officer.